As most merchandise is passed along to a friend or family after used, this Rectangular Bluetooth Speaker can help maximize your networking strategy with less of your effort. A functional wireless Bluetooth speaker with a sturdy body in a rubberised finish, it comes in 6 colours with a rechargeable Li-Ion 3.7V 400mAh battery and an AUX/USB cable. With an FM radio scanner and hands-free call function, this is one gadget that will be appreciated by anyone. Print is included on the top of this product as standard - check with us for any other areas. This speaker product is printed in up to 8 colours via pad print, which is a technique suitable for almost all artwork and shapes. 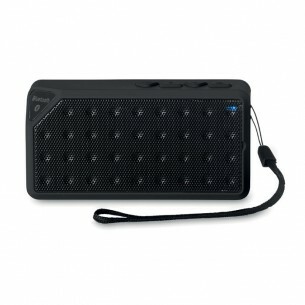 This rectangular bluetooth speaker is made from plastic, with colours including black, red , white, orange, royal blue, lime.